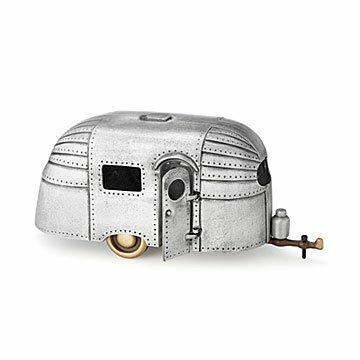 Set the clock back 70 years with this iconic sculpture modeled after a vintage Airstream trailer. It's 1949 and dad is hitching the Airstream to the car while you pack a polka-dot bikini for the family beach trip. 60 years ago, these aluminum cylinder trailers could be seen rolling down highways across America. Now, a miniature model inspired by the classic design can park on display in your home. Evoking feelings of chocolate slurgs and white picket fences, the idyllic sculpture provides a dose of nostalgia that'll razz your berries. Handmade from bronze and aluminum by vintage enthusiast Scott Nelles in Elk Rapids, Michigan. Check out this Vintage Trailer's companion the Hot Rod.